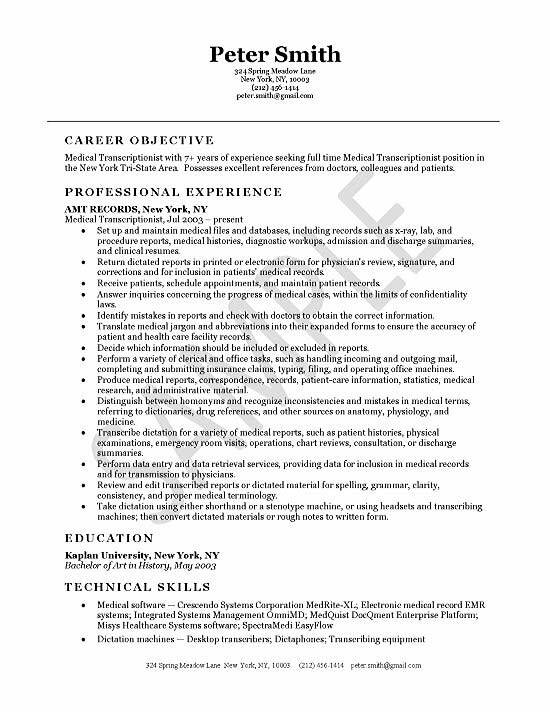 Here we have a resume example for a professional with experience as a Medical Transcriptionist. This is a unique sample for this profession and can be a reference for any specialist resume. The career objective is used to quickly identify their 7+ years of experience in their field. The job experience identifies key skills such as medical terminology, translation and medical files. The job seeker also features transferable skill such as database maintenance, data entry and reporting. The job section uses company name, date and job title as headings. The statements identify skills and highlight key responsibilities. As this is a job without much revenue, sales or cost reduction responsibilities, the key to getting a job interview will focus on knowledge and the ability to perform multiple tasks as the same time. Their training includes a Bachelor of Art in History. The candidate also lists technical skills in related software, systems and machines. Document and type medical reports interpreted by laboratory staff and Pathology department. Transcribe medical staff dictation from Radiology department. Sit in medical training seminars in order to dictate and transcribe course lectures into documents. Work with Pathology staff to verify patient testing requirements and results data. Proofread documents for spelling and grammar mistakes. Make physical copies of records to be filed in secure records room. Update patient data in medical system database. Put billing charges in system and audit patient charts for correct billing amounts. Submit final daily lab reports to scanning department and file reports in patient records.